Have you dreamed of getting married on the beach in an exotic place like the Pearl Farm Beach Resort in Davao or rediscover Pampanga on your honeymoon when you stay at Hotel Vida? 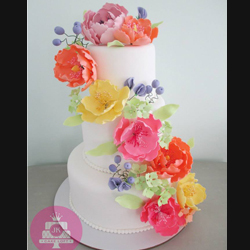 Do you want to plan a wedding so unique and creative that your guests will talk about it for months or years later? Every wedding celebration is unique so why have a "traditional" wedding like everyone else when you can get married with style. Having a destination wedding is a great way to start your life together as a couple filled with wonderful memories. Your destination wedding will not just be a one day event with your family and friends but instead a vacation that everyone will enjoy. If planned well, you can create a vacation that is both affordable and unforgettable for you and your guests. Working with reputable vendors and resorts will also help you avoid potential problems along the way. If you are not a hands on bride, or don't have the time to invest in research and planning, we recommend hiring a wedding planner such as VRC Creative Events. Let’s get started - When planning for a destination wedding or an outdoor wedding, choose a location based on your wedding style and a nonnegotiable guest list (if you say 30 guests, it will never go beyond 30). Unlike a hometown wedding, you can't assume everyone will be able to spend the money to attend. You'll need to get a rough estimate on how many people can come before you choose a venue. Just like traditional weddings, the more you invite, the more expensive it gets. Always ask questions - Achieving your dream wedding means having all the vital and relevant information you need to make the perfect choices. Do some research as well, so don’t be shy. Just ask. Work with those in the know - Work with a wedding planner who specializes in destination weddings and/or is based in the area where you'll be married. Wedding planners can also serve as your scouts to look for reputable wedding suppliers in the area. BYOP (Bring Your Own Pros) - Don't hesitate to bring in talent you trust from Manila for critical aspects such as your photo and video, hair and makeup, and sometimes your trusted wedding coordinators. What to expect when you BYOP? Expect to be charged for out of town rate. Rates differ depending on your location. If your wedding entails travelling via air or sea, you have to shoulder their fare (back & forth), at times accommodations for 3days and 2nights and meals. Your guests - If you've chosen a far-flung locale, make sure your guests have the ways and means to get to your venue/s (you don’t want anyone getting lost or stranded on their way to your wedding). If they plan to stay the night, it would be a nice touch to place a gift basket in their room that is full of essentials for the trip (suntan lotion, bug spray, slippers, etc.) and items that will remind them of the place (native food or crafts made in the area). 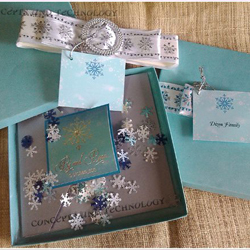 Bulky gifts – If you are having a destination wedding, don’t expect your guests to bring in gifts anymore. Just getting to your wedding costs a lot already, that is already a gift worth cherishing. If you have guests who are well-off and insist on giving you a gift, suggest that they bring small gifts that will not be a burden for them to bring. Guests may opt to give you gift checks. Wilcon Gift Checks is a great gift to receive. It is simple, convenient and stress-free way of gift giving! Newlyweds who receive Wilcon Gift Checks can choose from the finest selections of home-building materials, from construction-supply to tiles, sanitary wares, Do-It-Yourself items, kitchenwares, appliances, furniture, home accessories. Spice It Up! – Explore your wedding destination with your partner and share this experience with your guests as well. Plan out activities that you and your guests can enjoy. Do some research on the different activities which you can do during your stay. Reality check – Expect that some of your friends or relatives will not be able to attend. So don’t be upset. You have to consider that their fees for travel, hotel, and car rental can really be expensive, especially for a family. Your wedding may seem to be a mini-vacation for you but it may not be the one they can afford. To help them plan and save up for this trip, send out Save the Date cards. This would get the ball of excitement rolling in their calendar! Dress for no stress - Whether your dream location is specifically a beach or simply outdoors, always consider the climate when choosing your gown. Choose a dress made of light fabric and consider not having a train. A train will just drag in grass and dirt. Also you may want to stay away from shoes with spike heels, which will only sink into the ground. For beach weddings, one may opt to have foot jewellery instead, ornaments that adorn ladies’ feet. Mybridalfair.com and VRC Creative Events' latest project, Dream Weddings and Destinations - Before I Do 4th Edition, successfully concluded two festive days last November 23, at the Megatrade Hall 3, SM Megamall which featured Manila's best wedding vendors and professionals, showcasing the best of their services and products to hundreds of visitors. Co-Presented by Wilcon Builders’ Depot and Supply Inc. - the country’s pioneer in the construction-supply industry, introduced a perfect gift for newly-wed couples – the Wilcon Gift Checks and Fuego Hotels - one of the country’s most dynamic management company, on the other hand, featured four prestigious properties that they manage namely Taal Vista Hotel, Club Punta Fuego, Pearl Farm Island Resort and Vida Hotel to help couples decide where they can have their wedding or honeymoon. 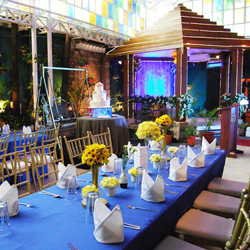 The event was hosted Mr. Andrew Que of Happy Events and Chacha Arevalo of Lifestyle Party Planners. Inspired by the beautiful outdoor weddings, Megatrade Hall 3 was decorated with flowers and foliage by Mr. Hardinero Landscaping and Flower shop. Blogging bride, Ms. Tahnia Dulay-Villamora got first place for the Before I Do Blog Writing Contest and won a 3day 2night stay at Hotel Vida. Ms. Charo Rejuso, the onsite booker of Before I Do 4th Edition, won a 3day 2night stay at Pearl Farm Beach Resort. Also, in support to the thrust of the Department of Tourism to promote Philippine destinations to the public and to attract soon-to-wed couples to the event, Mybridalfair.com and Fuego Hotels sponsored a Best Destination Prenup Photo Contest for soon-to-wed couples. Mark Bernal & Elza Martinez, who are about to get married on December 29 won a 3day and 2night at Pearl Farm Beach Resort and a blow up portrait of their entry for the Best Destination Prenup Photo Contest. Photographer John Mateos Ong took the breathtaking location shot of the couple at La Luz Beach Resort at Batangas and won a gift certificate for himself for an overnight stay at Club Punta Fuego. Daniel Alcantara, the lucky voter for the Best Destination Prenup Photo Contest, won a 3day 2night stay at Taal Vista Hotel. For two days couples and guests were serenaded by Glisten, The Girls Next Door, SJT Strings and Dos Sencillos + Uno. 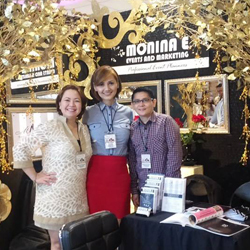 The participating exhibitors such as Imagine Nation Photography, Make up by AnneVida, My Diamond, New Horizon Hotel, Perfect Match Shoes and Ties, Pilipinas Teleserv, James Limsoc Photography, Redfox Photography, Sharlene Chan, NicePrint Photography, Patio Victoria Corp., BA Studio, Bash and Coordinates, Ibarra’s Party Venues, Glisten, Ever Bilena and 168 Events Management gave away raffle prizes during the 2 day fair.